BANGI, 30 May 2014 – The Goods and Services Tax (GST) is not a new tax but an updated and improved version of tax-collecting method that will help generate an extra RM8 billion to the national coffers. 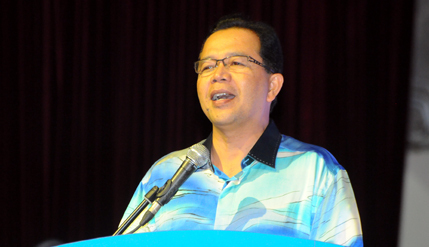 Deputy Minister of International Trade and Industry Datuk Ir Haji Hamim Samuri said it will enable the government to collect tax which it had failed to receive from business transactions between consumers and retailers, wholesalers and manufacturers. Speaking at The National University of Malaysia (UKM) Keris Mas College Student Awards and Charity Night here recently, Datuk Hamim said the GST and Trans-Pacific Partnership Agreement (TPPA) were among the moves the government plans to undertake to generate more income for the country. He said Malaysia is the third country in Asia, behind Hong Kong and Singapore, which depended greatly on international trade to generate income. Last year, almost RM1.4 trillion of its income was obtained from international trade and exports. However, from next year Malaysia will lose the Generalised System of Preferences (GSP) privileges from goods exported to the European Union and Canada because Malaysia had become an almost developed country. The absence of this privilege will result in higher taxes imposed by those countries on goods they imported from Malaysia. The TPPA would be given due consideration taking into account matters such as national sovereignty and Malaysians thus need not fear as the government will ensure the country’s interests are not compromised before the agreement is signed. If TPPA countries such as Australia, New Zealand, Brunei and Vietnam agree to the terms placed by Malaysia, the country will get the chance to obtain GSP from the TPPA nations. Datuk Hamim made the clarifications on behalf of Prime Minister, Dato’ Sri Najib Tun Razak who is also Finance Minister hoping that Malaysian would view efforts by the government to improve its income more rationally and based on facts. He praised students of the college for their creativity mentioning that they possessed qualities of being able to think rationally and implement research based on facts. University students needed to be able to have creativity and thinking skills so as to create an impact on the nation’s development. The event with the theme of “Magical Winter Wonderland: Hearts Drawing Night, Reality as Lovely as a Dream” was held at the Tun Abdul Razak Chancellor’s Hall (DECTAR). They also hosted orphans from the Limpahan Kasih Charity House for the charity event. Deputy Vice Chancellor (Student and Alumni Affairs), Prof Datin Noor Aziah Haji Mohd Awal, Principal of Keris Mas College, Principal Dr Ruslin Amir and his Deputy Haji Ishak Abdul Rahman attended the function which was sponsored by the Ministry of Finance, the Ministry of Higher Education, Les’ Copaque Production Sdn Bhd, Qaira Hijab Malaysian Online Hijab Store, Samihah Closet, Padieka Raccolta Clothing Store, Arif Bakar Creative Design and ByFatinSuhana Online Store.